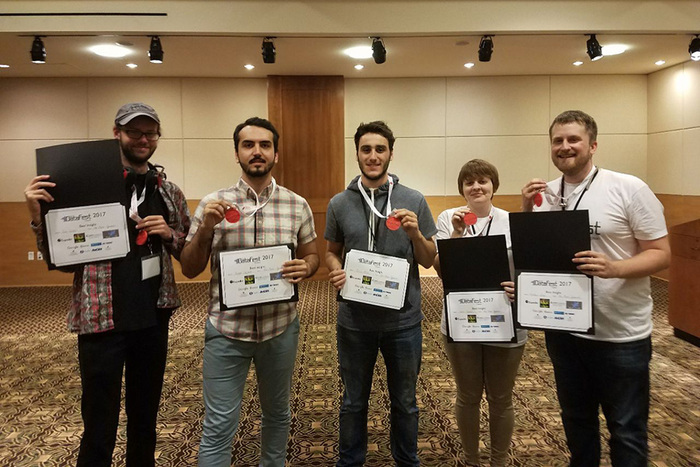 Five students make up the Mean Squares — the CSUN team that won the 2017 ASA Datafest at Chapman University. From left to right: Ian Postel, Seyed Sajjadi, Collin Miller, Jamie Decker and Matthew Jones. Photo courtesy of Wayne Smith. A team of five California State University, Northridge students beat 15 teams from other schools including Cal State Fullerton, UC Santa Barbara, UC Irvine and USC. The team — known as the “Mean Squares” — won Best Insight and Best Overall at the 2017 American Statistical Association DataFest, held in April at Chapman University. DataFest is a “celebration” of data in which teams of undergraduate students work around the clock to find and share meaning in a large, rich and complex data set. It’s also a chance for students to show their abilities to examine data, said Wayne Smith, lecturer in the CSUN Department of Management and faculty advisor for the Mean Squares. “DataFest is a regional, intensive event where student teams from many universities analyze a large dataset and present their findings to a set of esteemed judges,” Smith said. “These students are very much pioneers. What they accomplished is extraordinary,” because CSUN doesn’t have a statistics major and the students devoted countless hours outside of class to learn how to analyze data, he added. The judges at this year’s DataFest were senior faculty and industry executives who said CSUN’s team did an “incredible” job. Teams were judged on four categories: best use of external data, best visualization, best insight and best use of statistical models. Leading the Mean Squares was computer engineering student Seyed Sajjadi. Three factors set CSUN’s Mean Squares apart from the other teams, Sajjadi said. Jamie Decker was that art major. Decker said being an art student allowed her to use color as a way to present the information. For more information about the Mean Squares and how to join the Mean Squares, please email seyed.sajjadi.947@my.csun.edu.